It seems that every time I walk into a boatyard I inevitably find myself smitten by some under-loved (read derelict) classic beauty sitting forlornly off in a corner. Hmmm, I think, I could buy her for a song and with a little elbow grease and some TLC, she will be ready to go. Of course, all too often such thoughts represent the kiss of death, the beginning of bankruptcy, and may even lead to divorce. Thankfully, I usually get over my infatuation as soon as I leave the yard. However, on four occasions I’ve succumbed to temptation and ended up buying one of these orphans in pursuit of “the deal of the century”—in theory, at least. The first two were lemons, with one simply being cut up and hauled off to the trash after much effort. The third I was able to complete and actually sail, but only after a surprisingly large investment. For the fourth go-round, I actually got it right, at least by my standards, by employing the painful lessons learned from the first three, so that I finally made a great “fixer-upper” purchase. I still have that boat and expect it will be my last. So what is the secret to buying that perfect fixer-upper? Two things: First, before talking to the owner or asking around the yard, or worse, pulling out your checkbook, do some serious research on the particular brand and model of boat that has caught your eye. Go onto the web and search for an owners’ association or some other owners. Ask them about their boats. How do they sail? What kinds of problems have they had? Are there any common or known defects or shortcomings? Look for similar boats for sale and see what they are selling for. If you can find a similar boat locally that is in the water, see if you can find and talk to the owner. The more questions you ask, the more research you do, the more informed a decision you will make regarding sinking a lot of time and money into the apple of your eye. 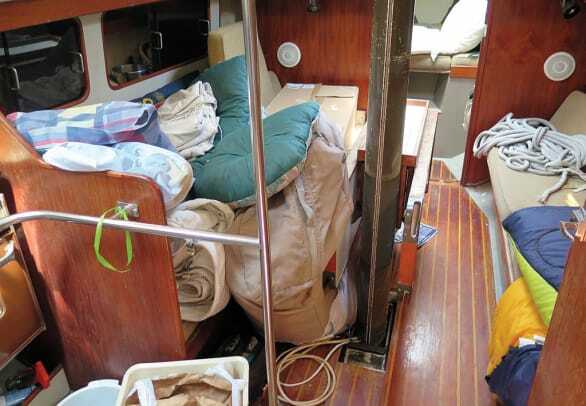 A classic beauty that sails like a pig, or is known for significant keel problems, or has a reputation for fiberglass delamination, will lose its appeal very quickly. If your research finds that your new love has a good reputation, sails well and has a sound construction pedigree, the next step—and this is absolutely the most critical—is to find a competent surveyor. The hundreds of dollars spent on a good surveyor could save you many thousands of dollars on “hidden” repairs that you, as a novice, would not have discovered until after making a purchase. There is little doubt that pretty much any problem on a boat can be fixed. All it takes is time and money. The job of a good surveyor then is to find any existing problems that will take what looks like a simple spit-and-polish project to a whole new level of deconstruction and rehabilitation. What follows is my own list of surveyor-discovered problems that portend a huge sucking noise coming from your wallet and your schedule. Wet or rotted core material in the deck or hull. A surveyor will use the combination of a moisture meter and a rubber mallet tap-test to explore the condition of the core in the deck and the hull (if it is cored) and find any delamination or wetness. If the core is wet, there is only one proper solution—remove either the inner layer or outer layers of fiberglass, tear out the old wet core material, replace the core material, re-glass what you ripped out and then refinish it. Depending on how much of the core is damaged and where it is located, such a repair can take months and require that significant portions of the deck hardware and/or interior structures be removed. This kind of repair requires a lot of fiberglass and finishing skills. Once the repair is complete, anything removed must be reattached and refinished. Having dug myself into this type of money pit twice, I can confidently say that a wet or rotted core in one spot is a good indicator that there is more damage somewhere else as well. A good surveyor will give you a clear idea of the extent of the problem. If the problem exists in more than a couple of small spots don’t just walk, but run away. Broken or detached structural members.This includes parts like bulkheads, stringers, floors, engine beds and mast steps. Proper repair of these types of problems usually requires the removal of large sections of the interior just to reach the area(s) needing repair. Such structural failures may also indicate abuse by a previous owner (grounding or collision), or poor design or construction, all of which will probably show up again somewhere else in the boat. This, in turn, can lead to continuous failures and requirements for ongoing major repairs. It can even result in a catastrophic failure offshore if something goes wrong while you’re on passage. Unless you are prepared to hire a professional to perform the repair, do not try this as an amateur. In the words of Monty Python, run away! Rotted plywood bulkheads. This is, unfortunately, an extremely common problem in production boats, especially around the bulkhead where the chainplates are attached. I once found what appeared to be a great deal (it wasn’t) on a well-known production 27-footer. Cosmetically the boat looked good and was well equipped. Visions of a “great deal” were swirling in my head right up until I put my finger gently on the chainplate bulkhead and easily pushed my finger right through the plywood that had rotted on the inside. In most cases, removing and replacing a main structural bulkhead will involve removing and reinstalling large parts of the interior cabinetry and other interior components, like water tanks, holding tanks and other major systems. 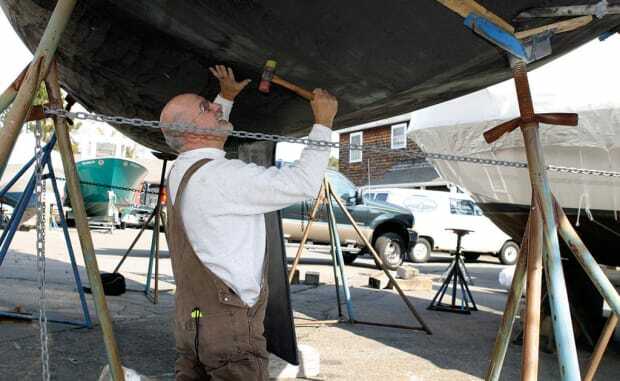 When removing major structural bulkheads, you must be very careful to support and stabilize the hull and deck so they cannot “move” or change shape after you’ve removed the structural support provided by that bulkhead. Speaking from experience, this shape change can be significant and have a ripple effect on other interior components. One time when I removed the main bulkhead of a small boat the deck dropped 4in and the beam increased by nearly half a foot. Like the commercials say, please don’t try this at home. Unless you are a pro, run! The following conditions are not necessarily show-stoppers, but they can quickly become expensive and consume vast amounts of time. Each needs to be carefully evaluated by a surveyor before you reach for your checkbook. Frozen or badly rusted engines and bad fuel tanks. When left in the salt air, cast iron will quickly start to corrode and deteriorate. Long-neglected boats often end up with a badly rusted and/or seized engine full of old and dirty (acidic) oil. Often these rusted engines can be started, which only leads to a false sense of reliability since that seemingly reliable corroded engine will then fail just when you need it the most. A surveyor can give you an honest evaluation of the engine’s condition, and whether it just needs servicing or a far more costly rebuild or replacement. If the engine has been neglected, so has the fuel tank, in which case it may very well have been left partially filled with fuel, water and other contaminants. If the boat has an aluminum or stainless fuel tank and has been sitting for a long time in this condition, corrosion of the fuel tank from the inside out will probably have occurred, and there is a good chance the tank will eventually develop a leak.With today’s environmental regulations, this could be an especially expensive disaster. Of course, in all likelihood it will be impossible to even attempt to start the engine on a badly neglected boat, because the battery is dead or missing, and the fuel tank is empty, contaminated or leaking so badly that any fuel you add runs out as fast as you pour it in. While an engine replacement alone is not a show-stopper, when coupled with a fuel tank replacement and what will likely be the necessary engine bed modifications, you can quickly spend $15,000, $35,000 or more, depending on engine size and the difficulty of removal and installation. With no way to truly verify the engine condition, you are simply rolling the dice and praying that the existing engine is salvageable. Severe blistering.I have firsthand experience with blisters and blister repair. Four times I have bought boats with varying degrees of blistering. A few surface blisters on a generally dry bottom are quick and easy to repair, and not a structural concern. 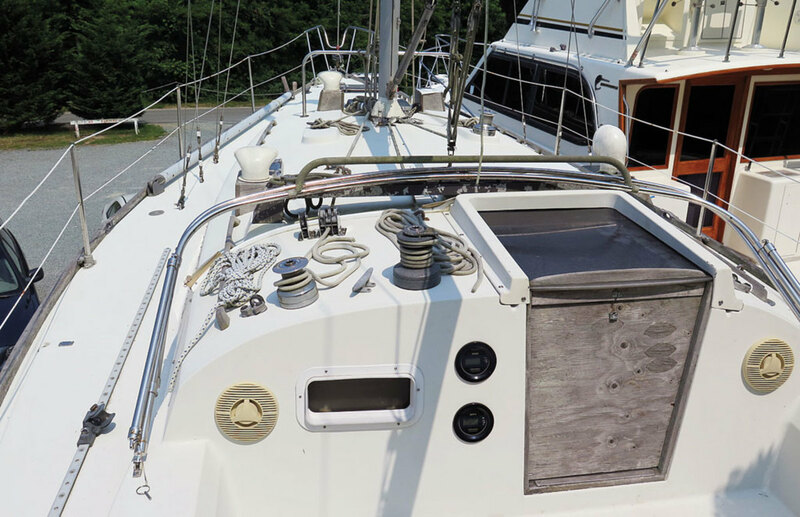 Extensive blistering that has gone deep into the laminate, however, is not only very difficult and expensive to repair properly, but it can cause structural damage to the hull. Deep blistering requires “peeling,” or grinding-off,the outer layers of blistered fiberglass and then applying a new layer, or layers of fiberglass over the entire bottom to build it back up again. 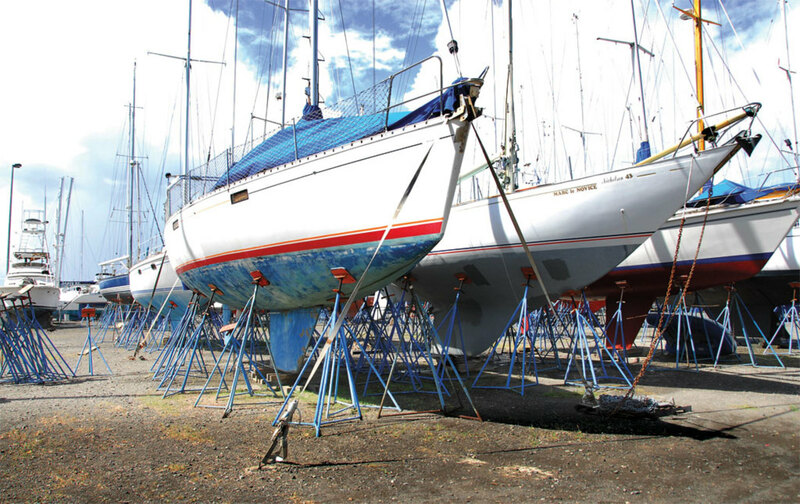 A boatyard will charge from $400 per foot to well over $1,200 per foot for a professional repair of extensive blistering. Ask your surveyor for a best guess on the cost. Be prepared to run. Old and defective wiring.Old wiring is not only unreliable, it can be a fire hazard. This is where “out of sight, out of mind” can be very dangerous. One common hidden defect in older wiring is internal corrosion. Most new boats are wired using “tinned” copper wire—wire in which each strand is coated with tin to prevent corrosion. Older boats, however, were built using bare copper stranded wire, which has an affinity for absorbing water through an exposed end. This moisture can then be sucked great distances within the wire’s insulation through capillary action, literally corroding it from the inside out.This, in turn, can cause intermittent failures, which inevitably happen at the worst possible moment. The bilge pump on my current project, for example, was working intermittently and needed rewiring. During that process, I discovered the old power wire was corroded from the bilge all the way up to the electrical panel, a distance of over 10ft. Again, here is where a good surveyor will be able to provide an unemotional assessment of your purchase and give you a good perspective on the potential cost and effort to bring the wiring up to snuff. In the end, buying and restoring a boat can be a very rewarding experience. The pride and self-satisfaction cannot be overemphasized. However, the disappointment if and when your bargain turns out to be an expensive and time-consuming lemon can also not be overemphasized. With this in mind, the key to buying my own successful fixer-upper was to first pick the brand and model I wanted and then go looking for one that was a fixer-upper—with my eyes wide open to any possible defects it might have. Then and only then did I make the decision to shower the boat that I ultimately purchased with love and affection: in other words, time and money! Finding a truly competent surveyor can be a challenge. I found the best way is to talk with the staff at a good boatyard or reputable broker. They know which surveyors are knowledgeable and do a thorough survey. Once you have a list of possible surveyors, call them and tell them you are considering buying a fixer-upper and ask what they would do special or different in that situation. If you don’t like the answers, walk away and find another.